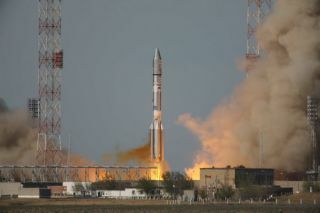 A Russian Proton rocket lifts off on April 25, carrying the SES-1 (AMC-4R) communications satellite. PARIS — A Russian rocket lofted a new satellite into orbitthat will be used for telecommunications in the United States. An International Launch Services (ILS) Protonrocket on Sunday successfully placed the SES-1 telecommunications satelliteinto a near-geostationary orbit about nine hours after liftoff from theRussian-run Baikonur Cosmodrome in Kazakhstan. The satellite's owner, SES ofLuxembourg, said it had acquired signals that the satellite was healthyfollowing separation from Proton's Breeze-M upper stage. SES-1, built by Orbital Sciences Corp. of Dulles, Va., willbe moved into final geostationaryorbit about 36,000 kilometers above the equator in the coming weeks and isexpected to be ready for operations by SES by late May. The satellite, formerly known as AMC-4R, will be operatedfrom SES World Skies' 101 degrees west orbital slot over North America and willreplace the AMC-2 and AMC-4 spacecraft there now. SES-1 uses Orbital's Star2.4-E platform and carries 24 C- band and 24 Ku-band transponders. SES, which has entered into multi-satellite launch contractswith Reston, Va.-based ILS and with the Arianespace consortium of Europe,contracted with Orbital for three nearly identical satellites, with an optionfor two more. SES-1 weighed 2,550 kilograms at launch,making it a light load for the Proton-Breeze-M, which can lift satellitesweighing more than 6,000 kilograms into geostationary transfer position. The available power relative to the light weight of thesatellite permitted Proton to drop off SES-1 into a circular equatorial orbitless than 2,000 kilometers below the geostationary arc, which is thedestination of most communications satellites. That permitted SES-1 to use lessof its own on-board fuel than it would have otherwise, resulting in anestimated service life of 16 years rather than the standard 15 years. SES-1 uses the same basic Star-2 platform design used by theIntelsat Galaxy 15 satellite that lost communications with ground teams earlierthis month. Orbital officials said the most probable cause is the violent solarstorms that occurred in the first week of April. SES Chief Executive Romain Bausch said SES continued withits launch without waiting for the Galaxy 15 anomaly-review board's finalconclusions because SES-1 includes backup systems that are not on board Galaxy15. The launch was the 22nd Proton flight in 21 months and thethird mission for ILS — which sells Proton on the commercial market — thisyear. The company has said it hopes to conduct 7-8 commercial launches in 2010after seven in 2009.